ANKARA, Turkey — Zeynep Gurcanli, a Turkish journalist, endured lengthy security checks upon arrival at Israel’s international airport on her previous reporting trips. This week, however, Israeli authorities rolled out a red carpet of sorts for media guests from Turkey, an old ally turned harsh critic. “An Israeli Foreign Ministry official meets the group of Turkish journalists inside the passenger boarding bridge, separates them from the other passengers and takes them to passport control in a vehicle waiting near the tarmac,” Gurcanli wrote online for Hurriyet, a Turkish newspaper. The VIP treatment, and the extensive reporting on Israeli views in the journalists’ newspapers back home, reflects a softening of tension between the two countries, though it is too early to call it rapprochement. The mood contrasts with a plunge in Turkey’s ties with Syria, an enemy of Israel whose troops occupied areas close to the Turkish border in a crackdown on anti-government protests. More broadly, the popular uprisings in the Middle East and North Africa have aligned Turkey, NATO’s biggest Muslim member, more closely with its traditional Western partners in shared calls for reform and an end to violence. The coordination, at least for now, undercuts a sense that Turkey had been turning “east” by forging ties with new friends such as Iran and Syria at the expense of Israel and other Western interests. Turkey had said it was expanding its range of diplomatic and economic relationships in past years under a policy known as “zero problems” with neighbors, but it is being forced to rethink an approach that was variously described as ambitious, visionary, naive and euphoric. “Syria was the ‘perfect’ example of the zero problems policy. Working with the West allows Ankara to pivot in a way that saves face,” Henri J. Barkey, a Turkey expert at Lehigh University in the United States and a visiting scholar at the Carnegie Endowment for International Peace, wrote in an email to The Associated Press. “It shows that Turkey is a responsible power that deserves serious consideration,” wrote Barkey, noting that President Barack Obama and Turkish Prime Minister Recep Tayyip Erdogan, who won a third term in elections this month, have been in regular telephone contact on the Syria problem. More than 10,000 Syrian refugees are sheltering in camps on the Turkish side of the border. Turkey initially balked at the idea of a NATO operation against Libya’s Moammar Gadhafi. Now it is contributing ships and other military assets, although it is not participating in attacks on forces loyal to the besieged leader. Just as in Syria, Turkish leaders ran up against the limits of unbridled engagement in the region when Gadhafi spurned their repeated calls for concessions to the opposition. Turkish Foreign Minister Ahmet Davutoglu, architect of the “zero problems” thinking and a driver of his country’s aspirations for regional leadership, signaled a major policy review when he summoned dozens of Turkish ambassadors to the capital, Ankara, last week. Some analysts speculate there is a looming rivalry between Turkey and Iran, even though Erdogan has spoken in defense of the Iranian nuclear program to the consternation of the West. Iran labels the uprising in Syria as a U.S.-led provocation and, also in contrast to the Turkish position, says other regional uprisings aim to replace Western-supported governments with Islamic leadership like its own. “We hear that Iran has a lot to do with the ongoing tension in Syria, which is not going to help relations,” said Ufuk Ulutas, a Middle East researcher at the SETA Foundation, a research center in Ankara. There remain potential points of contention between the West and Turkey, which is anxious to avoid international sanctions against Syria that would hurt its own economy. Turkey lost trade during years of sanctions against former Iraqi ruler Saddam Hussein, and penalties against Iran because of its suspected nuclear weapons program are also hurting Turkish business. 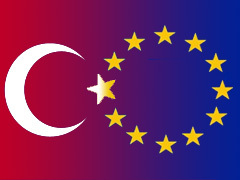 Additionally, Turkey’s bid to join the European Union has suffered because of European skepticism, Turkish delays in reform and a dispute over the divided island of Cyprus. Membership seems even more distant because of Europe’s financial upheaval. Turkey’s problems with Israel are rooted in the plight of the Palestinians and predate the so-called “Arab Spring” of uprisings against autocrats, but there are signs that Turkey does not want to raise tensions as it grapples with Syria and other challenges. Turkish activists abandoned plans to send a ship with a Europe-based aid flotilla aiming to break Israel’s sea blockade of the Gaza Strip in the weeks ahead. Last year, nine people on the same Turkish vessel died in an Israeli raid on an earlier flotilla. The activists cited technical glitches for dropping out this time, but the Turkish government’s appeals to act with moderation undoubtedly carried weight. Turkey still wants an apology and compensation from Israel, even as the West urges it to reconcile with its onetime ally, a move that could eventually elevate Turkey to the status of regional mediator with vital Western support. In the latest diplomatic whirlwind, leaders of Palestinian factions were in Turkey this week for talks, and Qatar’s emir arrived in Turkey on Friday to discuss regional upheaval. The Turks are “serious people and want to be seen as serious people who know there are problems in the region and have some sense of how to deal with them in a humane and principled way,” said a Western diplomat with knowledge of the Turkish perspective. The diplomat spoke on condition of anonymity because of the sensitivity of the issues. Turkish policy is pragmatic, said Alper Dede, an assistant professor of international relations at Zirve University in Gaziantep, a Turkish city near the Syrian border.